Hey there, hi there ho there.. you're as welcome as can be! No? Ok. G'day mate? No. I felt like doing a re-introductory of sorts. Because you know, why not. 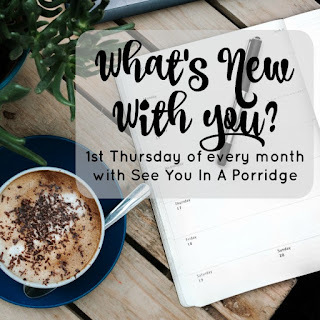 If you are new here and you want to know what the heck See You In A Porridge even means, then please read this post. 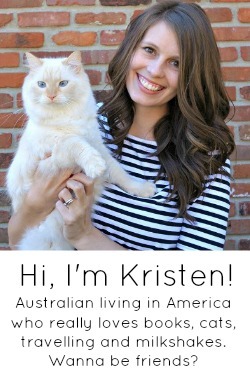 Pretty much all you need to know about me is that I'm Aussie (pronounced Ozzie), I love to read, I love cats and milkshakes though not together, I run sometimes (because of the milkshakes) and I have an unhealthy obsession with Pride & Prejudice. I hate watching anything without subtitles, I'm a child when it comes to anything Disney and I really wish I could travel more, though I love the life I lead. I'm 28. My birthday is the 12th of February. 12/02. I wish I had been born one day later because now when I write my birthday 'Australian' people think I am born on the 2nd of December. A lot of forms have been incorrectly filled out. My uncle nicknamed me Woody Woodpecker because I was an unfortunate looking baby, and the rest of my family called me Daddy Long Legs because I have abnormally large awkward long hands. I have two brothers. My older brother and I have never really gotten along. I love my younger brother more, and I'm allowed to say that because sisters can say that, parents can't. Plus my brothers don't read this blog. If they ever do.. just kidding Matt! My younger brother and I are the same age for 11 days. When I was younger I would let him 'be the boss' for those 11 days, but not really. We would tell people we were twins. My mum is one of 4, one of whom lives in England (soon to be Spain), another is the Woody Woodpecker culprit and the youngest married an Italian (I promise this has a point). I spent a good chunk of my childhood with them and their Italian family, so I feel Italian even though I am not. That was always evident when my their Nonna would continue to shove lasagne in my 'skinny little mouth'. And yes that's how we spell lasagne. I don't have a dad. Family is life, but not all family is blood. I followed 'my person' when she moved back home to KY, where I fell in love with a guy after spending only 4 days with him. I also met my other person. Then I married that guy (after we broke up for a spell) and now we live happily ever after with our cats, subtitles, books, pictureless blog posts and new email addresses (seeyouinaporridgeblog@gmail.com). Nice to meet you. Share a weird fact about yourself? I am always messing up the dates when I fill out for my birthday! Aww love this little recap of your life! And the Aussie was of writing your birthday would totally have me confused as an American haha! At first I was like wait, she said Feb...then wrote Dec... then I continued reading LOL! Happy Friday girl! What a cute idea! And you're still as awesome as ever! Fun fact - I cannot get my left and right directions together - seriously, how hard it it?!? Nice to "re-meet" you. :) Your dates totally had me messed up -- I was like, but I swear she just had a birthday..ohhhhhh. :) Hope you have good weekend!! I love these reintroductory posts...always fun to learn a new fact or two :) As someone with two Italian grandmas, I can totally picture their Nonna with the food...there can never be enough pasta! This is my favorite! I love intros and re-intros and your love of P+P!! Hmmm, something weird about me. I used to wear socks with open toed shoes and never flip flops because I hated my toes! That was middle school, kinda in HS and now I'm all flip flops everyday!! Weird Fact: My nickname growing up was Dirty Sally because my hair was always a tangled up mess & there was a lady called that in some western... she was always a mess. Love my family called me that. You're a good story teller my friend. Wait something weird...hmm...I count steps when I walk up or down them. That'll have to do...not through with my first coffee yet. Wow, you have family all over the world! So nice getting to know you more! Love this post! I love getting to know the bloggers I read all the time. Something weird, huh? I would be creative here because I'm plenty weird, but my child has decided to throw a fit and his screams are frying my brain's ability to function. Gotta run! What a fab post. Always nice to learn something new. Gotta love Italian families. What a fun post, lady! I love learning more about you :)! Is it weird that I knew all of this already? :) Something weird...hmmmm.....I have to check my phone to make sure I set my alarm at least five times before I can go to sleep. Most days it is more than that and I am not proud. I literally open the app, see that they are set and close the app. Then open the app back up again. It is a vicious cycle. Your family sounds like a fun bunch! The only thing missing is you ALSO live happily ever after with Pride and Prejudice in every printed version you can get your hands on ;) And yes to cats and milkshakes, but not together hah. Have a great weekend love! What a fun re-introduction. I had to re-read the part about "England, soon to be Spain." I felt I was missing some major world news about Spain taking part of England. LOL. I also love the part about you being the same age as your brother for eleven days. You're just asking for it when Matt finds your blog though. Not if....when! LOL. I also hate watching movies without the subtitles, because sometimes you can't make out what they're saying or something is said in the background that you'd never pick up on. So glad I'm not the only one! So when you watch movies you watch with subtitles? I feel as though I'd spend too much time reading and not watching what is going on, but I'll be honest I've mentioned doing this before to Joe but we have yet to try it! 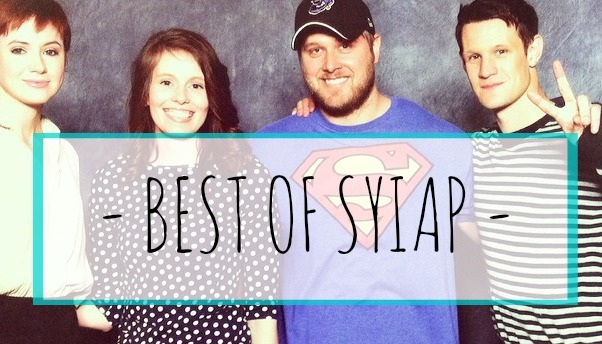 Such a fun post, thanks for the reintroduction! I like this reintroduction! I was so confused when I saw how you wrote your birthday but apparently I just need to learn to read a little more! I used to love Woody Woodpecker, so if it was me, I'd totally say it was a compliment! Weird fact about me? I fractured my ankle when I was 17, was in a cast/boot for 8 weeks, and my calves are still shaped differently from each other because one leg was doing all the work for 8 weeks. It's not something I think of often, so I have no idea why that was the first weird fact that just popped in my mind. But, there you have it. How nice to meet you again! You're one of my favorite bloggers for reals. I love this! Even though I already knew a lot of it, it's still fun to read it all in a nutshell. You're the best. Something weird? I have recently discovered that I have a hidden talent for rapping. Not even kidding. Not all family is blood. My best friends and parents practically adopted me and we are still the best of friends and my extended family. Family is life but not all family is blood - I love this hun! I love reading all of this (again) - I actually feel quite psycho that Ive read every post linked. You rock lady! Not sure if you like banana pudding but if you do, and you have a Zaxby's near by, you need to try their banana pudding milkshake. So, so good! And yes to the subtitles just because I can't hear very good and Cory get's tired of me asking "What did he say?" a million times. Makes my life much easier :) Amen to the not all family is blood! Loved every single ounce of this post! Perfect reintroduction, it should totally be your "about me". Also, get storytelling there, lady! I loved this post-- I need you to write an about me, for me because I never know what to write and this sounds so good! I have to admit to getting mixed up with the birthdate thing when it's written the opposite way.